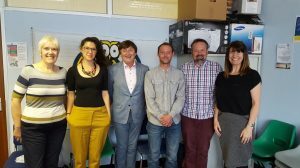 Last month, we welcomed Breda and Trevor from Manx Lottery Trust to Newcastle. They met with our Programme Manager, staff, and our Experts By Experience to learn more about how we're supporting people with multiple and complex needs. In this blog, Brenda and Trevor share their experience of the day and how the learning shared will help Manx Lottery Trust support people in the Isle of Man. On our recent trip to Newcastle, we were fortunate to be able to visit Fulfilling Lives, and meet some of the inspirational team. We first learned about the programme, its aims, outcomes and who it supports. The definition of someone experiencing multiple and complex needs, including ineffective contact with services, provided us with clear understanding. Working in partnership to effect system change is a key part of the programme. Experts by Experience, who give a wraparound service to individuals, shared examples of how their own experience helps them connect and build trust with clients, and identify why users are excluded from support they need. The Personalisation Fund is practical way of enabling the Experts to spend creatively to help individuals when, and how, they need it. A small amount of expenditure can make an enormous difference. For example, a cheap mobile phone can help contact with clients and be useful to ensure appointments are kept; shopping trips and visits can help educate and empower. Through discussion and sharing of experiences we realised Fulfilling Lives benefits not only service users, but also the Experts/Navigators, giving them stability and support in their work, with opportunities to achieve, set goals and fulfil potential. Important learning has been to ensure that new opportunities do not create overload for team members. Breda and Trevor from Manx Lottery Trust pictured with our Service Navigators Megan and Shane, System Broker Ray, and Programme Manager Lindsay. We looked at the various steps of the Ladder 4 Life model, with “Reflect” as the top rung. Throughout our visit this word cropped up many times and the importance of taking time to reflect is one of the key learning points brought back with us to the Isle of Man. Looking at the Ladder 4 Life could not have been timelier as we were able to apply or our learning to the first grant application for us to assess upon our return, which included a similar model for engagement with volunteers. Huge thanks to all at Fulfilling Lives, Newcastle Gateshead who took time to share their experience with us and also to Big Lottery Fund, Newcastle for enabling such a memorable visit. Find out more about the work Manx Lottery Trust does in the Isle of Man here.